This is one of my favorite techniques. When I saw it on today's Fancy Pants Blog, I simply had to share some of it here. The steps are simple, first stamp any image. I would not use an archival ink like Staz On, but rather a wetter ink, something like Distress ink if it's not a detailed image or Close to My Heart ink pads - one of my favorites. Of course versa mark works great, but not everyone has that. Finally, apply distress ink. 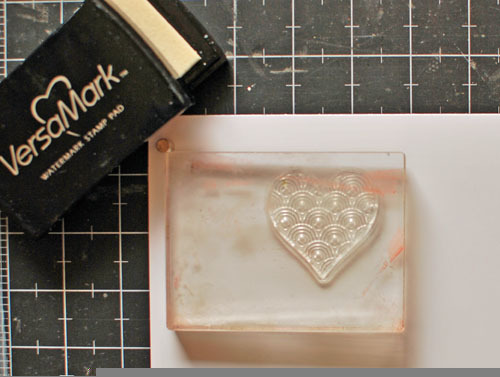 If you don't have a Tim Holtz ink applicator - get one! Er, I mean, use paper towel. Blot it in the ink pad, rub some off on scratch paper then apply to your project. But I love my ink applicators and use them all the time. 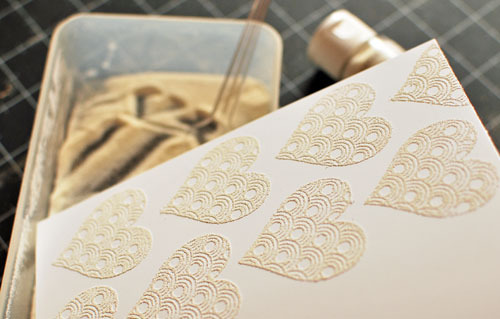 You've got a great base to create some really lovely projects. 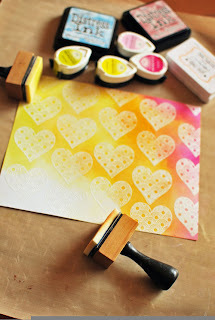 Of course if you don't want to emboss, you can get a similar look by applying ink to Heidi Swapp Invisibles. I've had some great fun with that paper! Why not give it a try? Post your projects on my Scrap with Shelby Facebook page.